Since setting up my Delta Dust Collector I’ve been searching for a good way to deal with dust collection at my drill press. After doing a bunch of research I stumbled upon a great kit from Peachtree Woodworking. 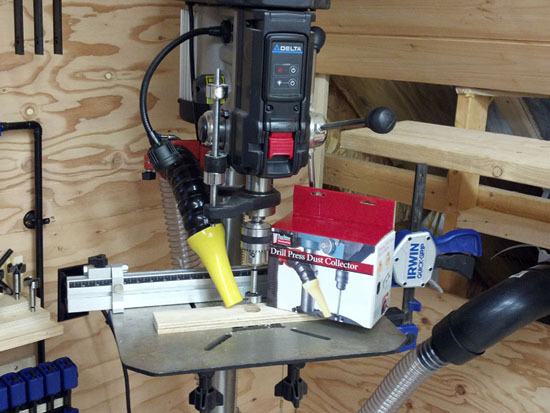 The kit provides everything you’ll need for setting up dust collection on the drill press. And…..VERY easy to follow/use directions. The folks at Peachtree Woodworking clearly know what they are doing! 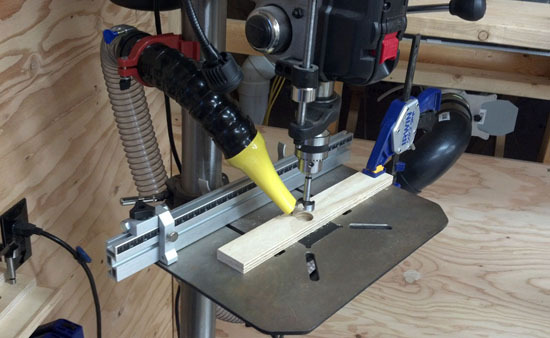 I kept trying to devise a set-up that I could use at the drill press to keep the work piece clear of debris and make it safer at the same time. Once I saw how Peachtree was solving this problem I decided to buy the kit and give it a try. As I mentioned above, the kit comes with everything you need to connect your dust collector to your drill press. 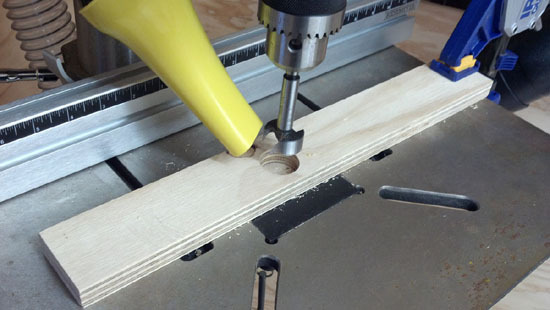 The hose is supported with a heavy duty collar that clamps to the drill press column. The hard flexible hose makes it possible to set the dust collector nozzle very close to the work piece and feel comfortable that it won’t move and be in your way. The picture above shows the drill running with no visible signs of large dust particles. Also notice that the collection end of the process is tapered and narrow in order to make it easier to get close to the work.